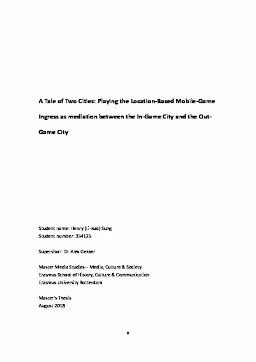 This thesis seeks to empirically investigate how seasoned players of Ingress, a Location-Based Mobile Game (LBMG), mediate their experience between an In-Game City, that is to say an urban environment that exists as players engage with the rules of the Ingress game, and an Out-Game City, that is to say an urban environment that exists regardless of whether the rules of the Ingress game are engaged with or not. In the spring of 2017, qualitative in-depth interviews were carried out with 13 seasoned Ingress players from the Rotterdam area. The analysis of this data had produced an understanding of the Four Processes of Playing a LBMG. When players engage in playing, four processes take place concurrently: Sensing the In-Game City, Making the In-Game City, Sensing the Out-Game City and Making the Out-Game City. 10 unique sub-elements are also identified, describing the themes and qualities that constitute each of the four processes, including how they pay attention to both the in-game software and out-game materiality, how they form social relationships with other players and so on. In summary, Ingress players actively construct their urban experience, both in the In-Game City and in the Out-Game City, while they engage in the Four Processes of playing of the Ingress LBMG.